This website is not affiliated with or endorsed by Focus on Energy or the Wisconsin Energy Star Homes program. We provide this website as a resource for anyone who may be interested in building an Energy Star or energy efficient home. 1 final site visit once home is completed for performance testing – i.e. blower door, exhaust fan performance. Carbon monoxide detector – hard-wired, integrated or plug-in models. One for each floor with a bedroom. Closed combustion, power vented or direct vented furnace/boiler, water heaters and fireplaces. Kitchen range hood that exhausts 100 cfm and bathrooms with 50 cfm - all venting must be ducted to the outside. Air flow – building air tightness must be equal to or less than 0.25 CFM per square foot of building shell area at 50 Pascals. This is determined at the final site visit with a blower door test. The site visits 1 and 2 help to identify areas that might contribute to overall house leakage. So along with all these bulleted requirements – it is VERY important that caulking and foaming penetrations through to the attic, sill box, and/or any other area that could contribute to leakage is done all throughout the construction process. These are leaned practices overtime and with facilitation from the WI Energy Star Consultant. 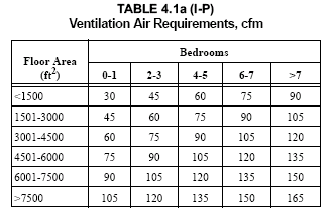 A bath fan that will be able to act as whole house ventilation and supply the required cfm listed below (continuously), unless you intend to put an Energy Recovery Ventilator (ERV) or Heat Recovery Ventilator (HRV) in the home – then this "switch" requirement goes away. This fan also either has to have a second remote mounted on/off switch outside the bathroom in a remote location (next to the thermostat is BEST) or be hard wired to a dedicated circuit breaker labeled “whole house ventilation”. A 3 bedroom 2500 sq/ft home would require the following to comply with the new STANDARD 1AQ for WI Energy Star Homes. Attic air sealing package – spray foaming over any penetration up through to the attic. Spray foaming over top plates of interior and exterior walls. Foam board insulation on foundation (versus fiberglass). Drainage plane should overlap onto the foundation exterior surface. Windows that comply with Energy Star criteria having a U-value of 0.35 or less. Take advantage of the rebate on CFL light bulbs – up to 40 bulbs per construction site at prices near $1.00 per bulb.